It’s no secret that the residential development boom New York saw in 2015 has carried over to 2016. A trend that’s discussed frequently, and one that we’ve touched on in the past, is the development of super-tall, super-slim skyscrapers. While this is one way to maximize a return on investment, what can be done structurally if a building’s zoning or footprint doesn’t allow for a super-tall design? Maximizing your net saleable or leasable area is a simple strategy known by most, if not all, residential developers. One simple way to increase efficiency is to reduce the amount of space given for the building’s common areas. However, in this increasingly competitive environment, this strategy is counterproductive as more prospective tenants search for amenity-rich buildings. Planning a super-efficient core that minimizes the need for common space and corridors is another tried and true technique for improving floor plan efficiency. For instance, moving a building’s structure to the perimeter and eliminating the need for concrete shear walls. A project that embodies this strategy is 170 Amsterdam, DeSimone’s collaboration with Handel Architects that recently earned an ACEC National Recognition Award. Located on a long, narrow site, the 20-story luxury building on Manhattan’s Upper West Side features one of the city’s most distinct exoskeletons. 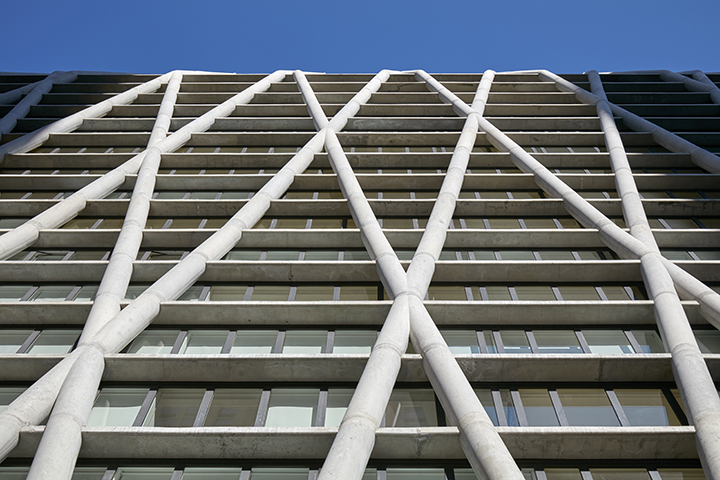 The exoskeleton structural system was designed using Revit and consists of exterior sloping concrete columns at the perimeter of the building. While the aesthetic is unique and creates a three-dimensional appearance, the ultimate goal was to help the developer maximize the available floor area, which was accomplished by moving the structural framing to the exterior. The unique diagrid system utilized also allowed the developer and architect to incorporate floor-to-ceiling windows that provide residents with cityscape views. With the exoskeleton in place, the internal structural supports were eliminated, thus freeing up more valuable interior space for the developer. The lighter and stiffer structural system also utilized less material, which reduced construction costs. The formwork for the columns consisted of an intricate fiberglass system of repetitive units that allowed for maximum reuse. The form system and reinforcing were designed so a pump-placing tube could be inserted into the shapes to achieve a smooth, undistorted surface. 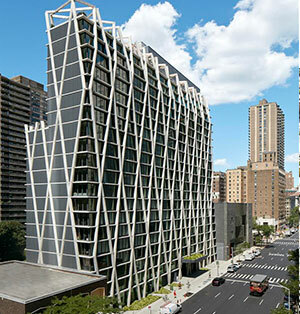 The next time you’re looking at a site don’t just envision a typical building utilizing traditional building systems, think of 170 Amsterdam and the many innovative and creative structural solutions that are available to maximize ones investment.